Working on behalf of the Environment Agency, Team Van Oord has successfully completed an innovative scheme to provide improved protection from flooding to households, infrastructure, agricultural land and an area of outstanding natural beauty within the Severn Estuary. The scheme at Stolford features the deployment of block revetments, as developed in the Netherlands, instead of the conventional rock revetment approach – to provide an affordable solution to a long-term problem. The scheme was carried out by a team from Kier and the Dutch based designers RHDHV, working as part of Team Van Oord. Work began in November and the project was complete before the end of 2018. 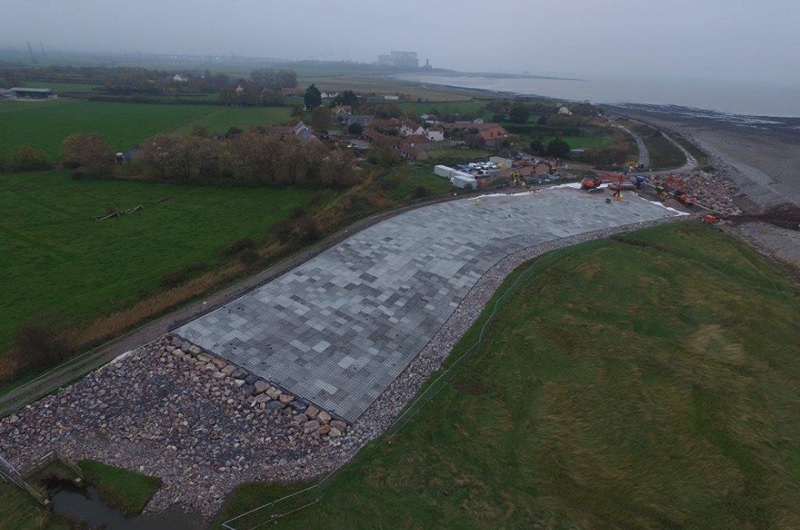 Existing flood protection for the village of Stolford – located within the Severn Estuary Ramsar site, Special Protection Area (SPA) and Special Area of Conservation (SAC) – comprised a shingle ridge on the beach that needed regular repair. This was viewed as unsustainable by the Environment Agency over the longer term, so an innovative new approach was agreed which transferred the primary flood defence function to an existing earth bank further inland. However, the existing bank required building up to withstand one in 100-year storm conditions. More traditional flood protection methods – such as rock revetment and wave recurve wall – were ruled out as they exceeded the challenging construction budget, which was set at £850k. Importing large quantities of rock would also have been highly disruptive to residents who live along the only access to the site, which runs directly through the village. Using their extensive knowledge and links to the Netherlands, Team Van Oord identified the Hillblock block flood protection system – new to the UK but extensively tried and tested in the Netherlands – as the most cost-effective and appropriate option. 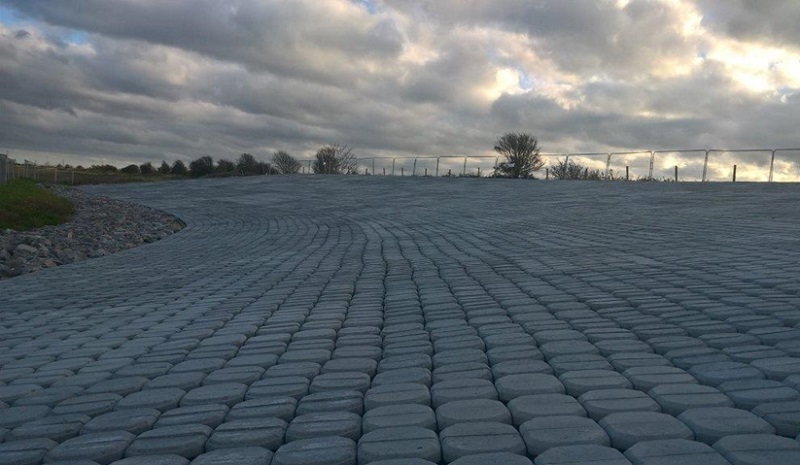 Hillblock is an innovative revetment block that varies in size from 200 mm up to 700 mm. Due to the shape and configuration of the voids, when placed together there is a significant reduction in the impact of energy from waves and wave run-up of up to 30%, compared to other types of shore protection. As the wave hits the Hillblock system, the water penetrates the voids between the blocks. These voids provide an enlarged flow area; this reduces the wave run-up by increasing friction and the pressure needed to squeeze the water through the channels. Hillblock has been tested to stringent Dutch flood protection standards, which has demonstrated that its stability is ‘best in class’. This means that the height of revetments can be reduced compared to conventional systems, hence reducing the overall material quantity, costs and eCO2. Hillblock is quick, safe and easy to install at a rate of 500m2 per day, using a specially adapted grab to install 20 blocks at a time. Compared to the other option of delivering large volumes of rock in many large truck loads, via small villages and narrow roads, this reduced the disruption to residents in the area and the environmental impact. The hollow spaces within the blocks also provide living space for flora and fauna, both above and below water. This allows for habitats to develop over the coming years by the waterline, adding to the area’s many existing features of outstanding natural beauty. The project received some funding from the Dutch Government’s ‘Partners for Water’ programme, which supports the use of Dutch water management innovations worldwide – with the aim of improving global resilience while supporting Dutch businesses. “This first use of Hillblock in the UK represents a new standard in coastal protection – providing stronger revetments at lower cost. Team Van Oord is a Joint Venture partnership between Van Oord, Kier, Mackley and Royal HaskoningDHV who between them have a combined turnover in excess of £5bn. Team Van Oord has previously worked in this part of Somerset when delivering the award winning Cannington Flood Defence Scheme which was officially opened by the chair of the Environment Agency, Emma Boyd-Howard, in October 2017.